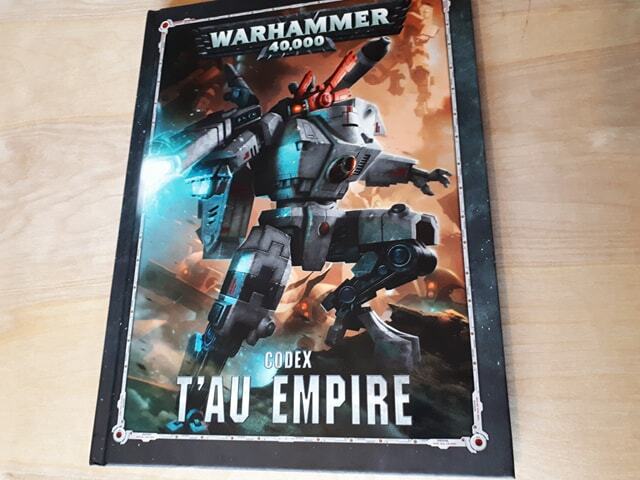 HomebooksWarhammer 40K Codex: T’au Empire Review – The Greater Good Just Got Greater! In Warhammer 40,000 it’s fairly suffice to say that there aren’t strictly any “good guys”. You’ve got Space Marines touting across the galaxy on some dictatorship-driven, religious crusade wiping out alien civilisations. Chaos plow through any living creatures they can get their hands on. We’ve got Dark Eldar who would sooner torture you for two-hundred years than outright kill you to help keep themselves alive. Then there’s the T’au. The youngest race within the universe seeking to unify the galaxy under one banner caring not of species or creed. Whilst they’ll surely kill you or put you to work in their camps if you don’t accept their terms, the fact that they give you the offer of peace first is…nice? What’s been going on then? Without spoiling too much, it’s safe to say that T’au are fully up-to-speed lore-wise with all the goings-on since Cadia. Should you wish to not learn more than this, skip down the article a little! They’ve come a long way since Damocles as the T’au are continuing to expand since the birth Cicatrix Maledictum. When Cadia went pop the T’au were on the far side of it from Terra, meaning the Imperium lost track of where they were and what they were doing. They’ve now reappeared seem to be fighting fit and doing well all things considered! The T’au embark on incredible large-scale colonisation efforts across the galaxy from time to time. These are called Spheres of Expansion. The “Fifth Sphere of Expansion” set off on a new extensive campaign continuing to colonise and consolidate worlds in the name of their “Greater Good”. I imagine they still care very little for the Warp and all the drama within so are somewhat unphased by all the goings-on lately. They find a vast swirling vortex in space which they learn to be a gateway that they dub “The Startide Nexus”. They soon discover that within are several survivors of the Fourth Sphere Expansion which as far as we know was a catastrophic failure. Of course, it’s this time the Death Guard decide to pop up their foul-smelling heads and get stuck in with the T’au. What comes of it? We’ll have to see. There really is some absolutely lovely artwork in this book. A lot of people who I’ve spoken to regarding T’au and their transition into 8th edition often respond with grumbling. They found things to be too expensive or simply unreliable compared to the days of 7th. Going through the book it feels as though T’au players can rest easy. There have been some notable point cost reductions which sound as though they will be welcomed with open arms. I took a look through the book and made an example list from the current Index. I made the same list with the new values from the codex and compared. The list in the index that came to around 1500 points with various units (Broadsides, Kroot, etc) ended up at around 1200 from the new book. That’s quite a saving! This means that, providing you’re point-savvy you can really capitalise, especially in those bigger games. In the example above you could potentially squeeze in a Riptide, or a Devilfish and some Pathfinders with space leftover! I’m not going to go into point costs specifically, but things that felt should be cheaper now seem to be. Of course, the T’au now also get access to Stratagems as well as the individual Septs (effectively akin Space Marine Chapters for for T’au), get their own “Tenets”. The T’au Sept, as mentioned on the Warhammer Community Site, get the “Coordinated Fire Arcs”. This is as horrifying as it sounds, this allows the Greater Good ability or when firing overwatch to hit on 5’s and 6’s, regardless of their ballistic skill. It makes sense, this is exactly what T’au are good at. The new rules in the book are dynamic, appropriate and offer some nice versatility for T’au and their firepower. For those who may still be upset that only one commander can now be taken per detachment, don’t worry, you have PLENTY of other options. The book is simply a must-have for any T’au player, and not just because of the updated rules. 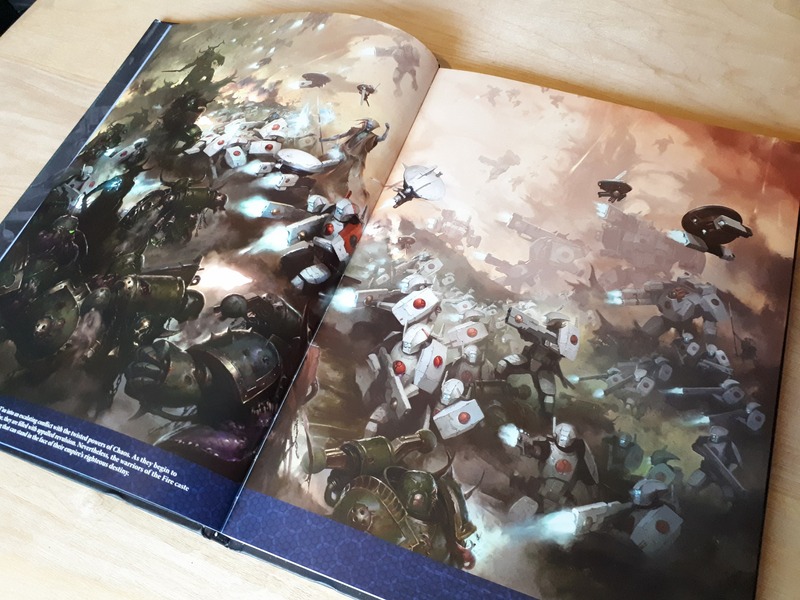 It swiftly propels T’au into the updated Warhammer 40K universe in the current edition with rules that fit beautifully alongside. Players will surely be gleeful over the reduced points costs in the book, also. There are pages and pages of lore, rules and stunning artwork. Anyone who fights for the “Greater Good” simply cannot ignore this book. Perhaps you’re looking for an army full of cool-looking mech suits with astonishing amounts of ranged firepower? Consider your search over! As always, stick with us on Facebook for all the latest on tabletop wargaming. Shadespire: Fun Picks from Spiteclaw’s Swarm! While some units have seen a welcome and deserved points drop, 15-20% for riptides and and even greater drop for broadsides, unfortunately over half the base costs and the majority of the weapons stayed exactly the same cost including crisis suits and their weapons. Although they tried to make crisis suits better by including lots of Stratagems which affect battlesuits they are still in a poor spot with no points reduction, hence they had to do the clunky restriction on commanders because the atypical commander spam would still have been a thing. 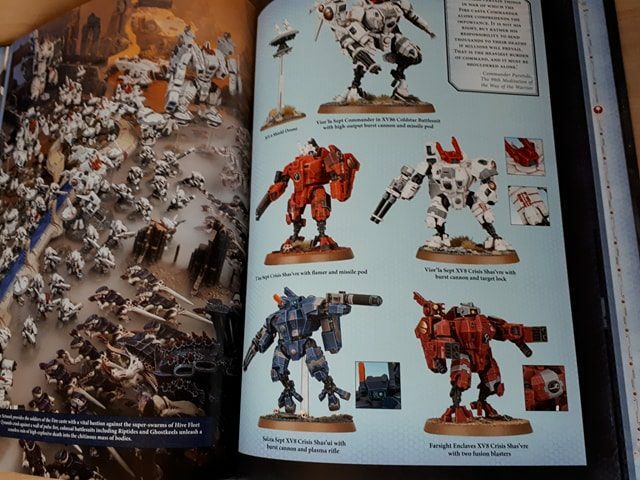 Overall if you didn’t play with 5+ commanders the codex is an improvement and more varied list will be seem, less commanders and gun drones, more fire warriors, broadsides, riptides and Ghostkeels.